In a recent radio interview, Speaker of the House Paul Ryan (R-Wis.) justified the insertion of this provision on the grounds that without it businesses would face shortages of seasonal workers of the kind covered by the program. Is there evidence for Ryan's claim of a labor shortage? If there is a labor shortage, then wages should be rising rapidly for these occupations as employers struggle to recruit new workers or retain the ones they already have. In economics, the price of anything — steel, wheat, or workers — rises if demand outstrips supply, and of course the price of workers is primarily wages. 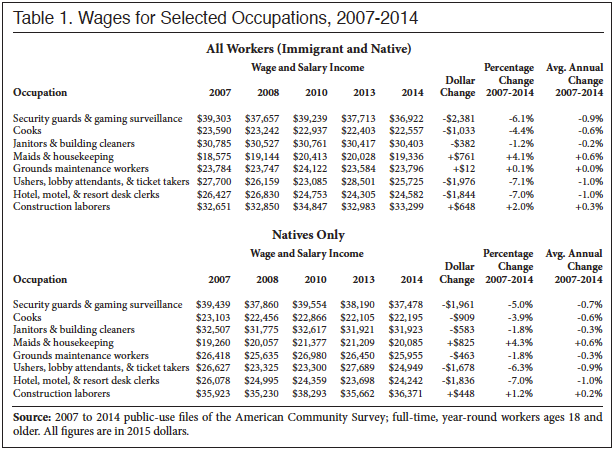 Below we look at wages in 2007 and 2014 (the most recent ACS data available) in some of the top H-2B occupations using the public-use files of the American Community Survey (ACS). The top of Table 1 reports wages for all workers (immigrant and native-born) and the bottom of the table reports wage figures for natives only. (Table 2 reports sample sizes.) Table 1 shows that real wages (adjusted for inflation) increased little or actually declined from 2007 to 2014 for many of these occupations. The occupation that did the best was maids and housekeepers; it saw roughly a 4 percent increase from 2007 to 2014, or 0.6 percent annual wage growth on average. This is hardly a large increase. It is worth pointing out that this is a very low-paying occupation to begin with and those who work in it received an average wage increase of just $2 a week over a seven-year period. Unlike maids, who at least saw a trivial increase in wages, many occupations examined in the table saw an outright decline in annual wages. In short, the wage data, at least for these occupations, shows no evidence of a tight labor market. Of course, the whole idea that wage increases justify increased immigration to reduce or hold down future wage growth is highly questionable. After all, these occupations are often filled by the least-educated and poorest Americans — immigrant and native. Allowing wages to increase can be seen as a positive development because it reduces social inequality and encourages work. But even assuming that rising wages are a negative development that must be addressed by increased immigration, there is still no evidence in the wage data that workers are in short supply. So the stated reason for the increase in the H-2B program is unsupported by ACS wage data.